NVIDIA extended its buyback authorization last quarter. Now it's time to see if management used it! Graphics chip and mobile processor maker NVIDIA (NASDAQ:NVDA) provided guidance below Wall Street's expectations when it reported earnings in November, and consequently has sat out the recent stock market rally. 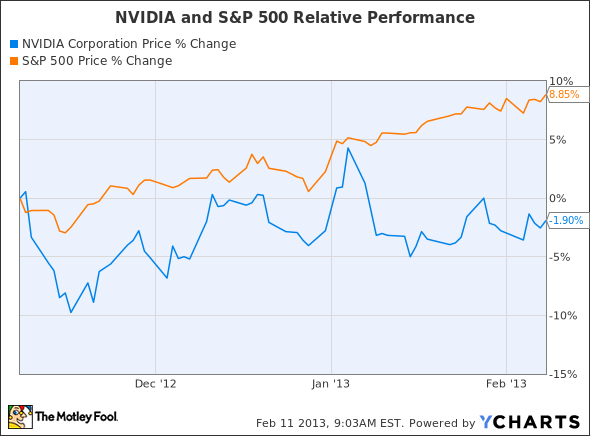 NVIDIA and S&P 500 Relative Performance. Data by YCharts. However, the company made some tentative steps toward returning cash to shareholders, which softened the blow. For the first time, NVIDIA initiated a quarterly dividend. With an annual payout of $0.30, NVIDIA's dividend yield of 2.4% is fairly good for a tech company. NVIDIA's board also extended the company's share repurchase plan. One of the key things to look for in NVIDIA's upcoming earnings report (Wednesday after market close) is whether the company made use of the repurchase authorization to retire shares. Strictly speaking, there's no such thing as too much cash. However, NVIDIA's recent capital allocation policy has not served shareholders well. As of late October, the company had $3.43 billion in cash and short-term investments on its balance sheet. Assuming no share repurchases, this amount has probably grown to around $3.8 billion by now, as NVIDIA received a $300 million royalty payment from Intel (NASDAQ:INTC) in January as part of a cross-licensing agreement between the two companies. Cash thus represents nearly half of NVIDIA's market cap of $7.9 billion. While NVIDIA has had the authority to buy back up to $1.24 billion of stock for several years, the company has not repurchased any shares since 2008. 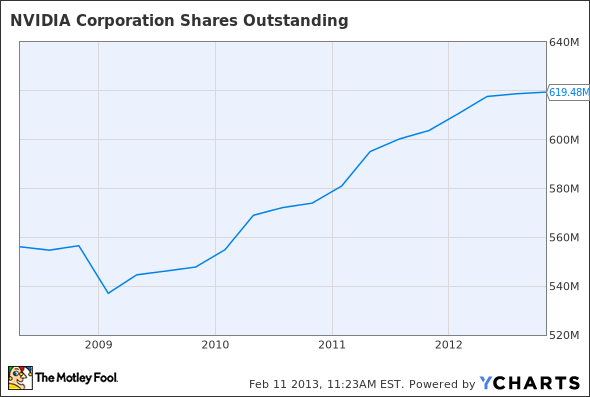 NVIDIA's share count has grown significantly since then as employees have exercised their stock options. NVDA Shares Outstanding. Data by YCharts. This increase in the share count dilutes the holdings of NVIDIA's investors and leads to lower EPS. By using excess cash to repurchase shares, NVIDIA could reverse the recent growth in share count, boost EPS, and (hopefully) increase demand for the stock. Obviously, profit is the ultimate driver of value for any business. However, NVIDIA's near-term earnings do not really reflect the company's future prospects. As I wrote last week, NVIDIA will have an opportunity to challenge market leader Qualcomm for a piece of the growing smartphone processor market when it releases its first integrated mobile processor (code-named "Grey"). However, this product will most likely debut in the fall; until then, NVIDIA is at a severe disadvantage and is unlikely to gain market share. In the discrete GPU business, NVIDIA has been taking share from struggling competitor AMD (NASDAQ:AMD) for the past several quarters, since NVIDIA's new Kepler generation chips came to market. AMD has cut its workforce dramatically in recent months to save money, and this could give cash-rich NVIDIA a permanent research and development advantage. However, some observers think that the discrete GPU market will be more or less eliminated by upcoming generations of chips from Intel and AMD that include better integrated graphics solutions. NVIDIA's Q4 earnings report will provide little or no insight into these important trends. As always, people will first look at revenue and earnings when NVIDIA reports its quarterly results this week. However, with the company's future earnings dependent on industry trends and products that have not been released yet, the status of NVIDIA's share repurchase program may be just as significant. NVIDIA has a substantial amount of excess cash on its balance sheet, and it would be a positive for shareholders if the company used it to offset the dilutive effects of employee stock option exercises.